As Keats so wonderfully wrote, Autumn is a ‘season of mists and mellow fruitfulness,’ when the trees are laden with ripe fruit just ready for picking and the hedgerows sweetly scented with an abundance of plump juicy berries. And what better way to use up a glut of apples or a barrel-load of blackberries than to convert them into delicious fruit wine?Making your own fruit wine isn’t overly complicated nor does it require loads of expensive equipment; what you do need though is patience. First wash the bucket and its lid in warm water and sterilise according to the instructions on the packet. Prepare the fruit by first washing in warm water. Remove the stems and any rotten or damaged bits but don’t peel. Soft fruits: place in bucket and mash slightly. Remove stones from large fruit but small pips and stones can remain. Add 1 litre of boiling water and 400g sugar and stir well. When the sugar has dissolved add cold water so the liquid just covers the fruit. Leave until the temperature has dropped to 50oC and then add the pectic enzyme. Leave to stand for about an hour, stirring occasionally. Now you need to leave the bucket, with the lid on loosely, for 3 days to ferment. It needs to be kept at a temperature between 20 and 27oC. Strain the contents of the bucket through the straining bag, sieve or muslin, through a funnel into the sterilised demi-john. Gently squeeze the fruit to extract the juices but don’t squeeze it to the bitter end – as bitter is what it will be! Dissolve the rest of the sugar in 800ml hot water and allow it to cool slightly. When its temperature is less than 40oC, add to the demi-john. The level in the demi-john should be 4.5 litres; if necessary add a little more cold water. Put the air lock in place and leave the demi-john at a temperature between 20-27oC for 3 weeks. When fermentation is complete add the campden tablets and stir regularly for the next 48 hours. Then add the finings as directed on the packet. The next stage is bottling but before that you may like to do a preliminary taste test. The true flavour of the wine won’t emerge until it has been allowed to mature but at this stage an early indication of the way it will develop can be seen and corrected if necessary. 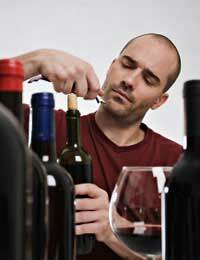 When you are happy with the taste, siphon carefully into sterilised bottles, making sure you leave all the sludge undisturbed at the bottom of the demi-john. Cork and leave to develop for 4 weeks or longer.